That’s what we heard from Kerry Litchfield, a lady who lives in a beautiful house in one of Vermont’s most beautiful small towns, Duxbury. Located in northern Vermont, between Stowe and Burlington, Duxbury is mostly wooded, and as you can see in the photos, Ms. Litchfield’s country home is located just at the edge of a rich woodland. 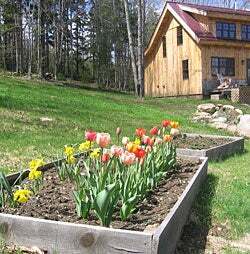 Even with Vermont’s harsh winters, she had great spring bloom from some from American Meadows that she planted last fall. She tells us she planted them in several places, and all did well. She was especially happy with the robust size of the blooms, and was kind enough to share these photos with us and our members.